I prefer to do my daily driving in the Chrome OS Beta channel. It's stable enough for me so I can catch a glimpse of the newest features in Chrome OS. With each update, I must admit, I get a little giddy about it because I'm always curious what sort of change it will bring. 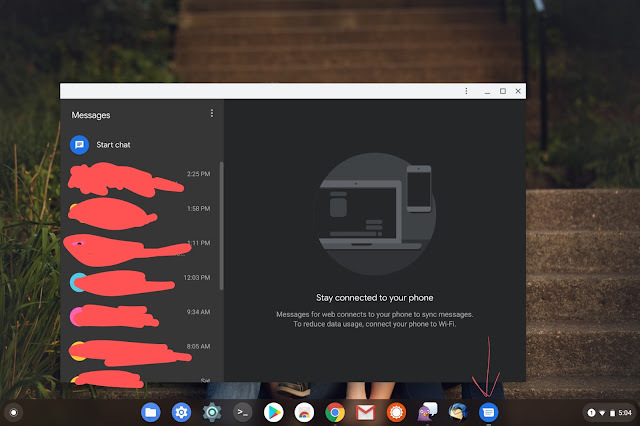 With the latest update to the Beta Channel on my Pixelbook - Version 71.0.3578.49 (Official Build) beta (64-bit) - Google has added a designated Android Messages app. Well, to be fair it's more of a PWA (Progressive Web App), but nonetheless it runs as a separate entity. When a message comes in I still get the notification so I can just open the messages app without having to always keep it open. It reminds me a lot like Apple's iMessage. With little tweaks like this, it's hard to argue that Google isn't headed in the right direction with their operating system. Let me know what you think in the comments below. Android Messages as stand-alone app. Chrome OS has come a long way from just a few years ago. With Project Crostini running Linux apps, it has flung the door WIDE open for Chrome OS. A good friend of mine is always telling me Chromebooks aren't "real" computers, but I beg to differ. Honestly, two things that I wish I could do with my Chromebook is less about Chrome OS and more about Microsoft being stubborn and not wanting to fully support for other platforms. Psh. Unreal. Ok, so you want to digitize your old home movies but you own a Chromebook and need to rip those DVDs? Easy. Well... It was slightly harder than I originally anticipated. If I wanted to use Handbrake, this was super easy to do. Type in sudo apt-get install handbrake and boom it was installed. Crazy simple thing to do. Hey, folks. Since my last post I have come across many different forums asking if their Chromebook supports Crostini (Linux apps) then how can they install Libre Office. There are so many different flavors of productivity suites that can be installed on Chrome OS and I'll list some of the options here. For good measure, Linux apps support started out as "Project Crostini" so here on out I will refer to Linux apps as Crostini. Polaris Office (Google Play)Microsoft Office (Google Play)Microsoft Office (CrossOver app through Google Play. This uses WINE to run the Windows version of Office. This option can only be used in tandem with an Intel-based Chrome OS device. Sorry ARM folks! )Libre Office (Crostini)Open Office (Crostini)Google Office Suite (google.com and Google Play) The above list is not exhaustive, but it gets a point across that Chrome OS is becoming an universal device that gives users many options. Google fanboy. Coffee junkie. Love puns. Copyright Inside Chrome OS. | Chrome is a registered trademark of Google.